Gluten free bread crumbs are so easy to make! If you have to follow a gluten free diet and you are worried that you will have to say goodbye to crispy breaded eggplant parmigiana or foods like coconut shrimp because of the bread crumbs than you came to the right place! Bread crumbs made with no gluten can usually be purchased in some health food stores but I must admit here in <?xml:namespace prefix = st1 ns = 'urn:schemas-microsoft-com:office:smarttags' />Florida they are very difficult to find so most times I just wind up making them on my own. If you make your own gluten free bread you can use that, just be sure to cut it into ¼ or 1/3 inches slices. 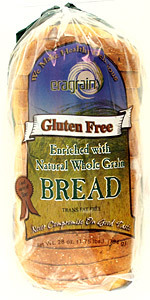 It is wheat free and gluten free and has a full flavor and a texture just like regular bread. The bread is actually made with an ancient African whole grain called Eragrostis tef. Place the slices of bread under the broiler and broil for 4 1/2 minutes. Flip slices of bread and broil for an additional 4 ½ minutes. If using a toaster set to medium dark setting. Set aside crispy toast slices and let cool for ten minutes. Using either a food processor or clean coffee bean grinder place one slice at time by tearing up the toast and keep pulsing until bread crumbs are formed. Repeat this process until finished. I definitely prefer the coffee grinder method, in my opinion the crumbs come out perfect this way. The bread crumbs can be stored in the refrigerator for weeks to come. I use them for everything from breaded mozzarella sticks to gluten free chicken parmigiana and no one ever knows that they are gluten free!